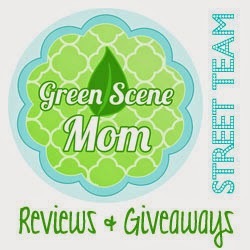 This afternoon's WAHM is Ashley from Geeky Cheeks Cloth Diapers. You can find her on FACEBOOK and ETSY. Here is her Bio. My name is Ashley and I am the owner of Geeky Cheeks boutique from Texas.I am married and mother to an active one year old boy. 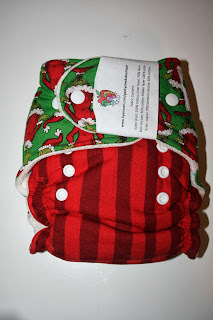 I started cloth diapering a little late in the game (5 months) but I became instantly OBSESSED! I decided to make some for my son out of old T-shirts and woven fabrics and they turned out rather nice. My sweet husband suggested I make some to sell and that's when Geeky Cheeks Boutique was born. I specialize in hybrid fitteds but I'm going to dip my hands into some all in 2s soon! Each hybrid fitted is constructed from an inner layer of organic bamboo velour, a hidden layer of poly-fleece, and a decorative outer layer from a cotton knit, cotton woven, or in occasion Minky. The soaker is petal style and made to easily snap in and out. 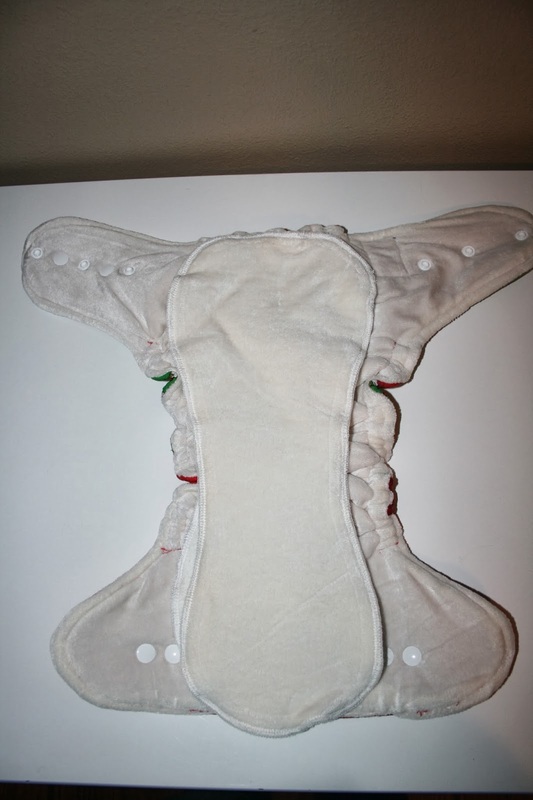 It is made from 4 super thirsty layers of super heavy organic bamboo fleece topped with the same velour on the inner of the diaper shell. I work hard to ensure each diaper is compliant with CPSIA rules and regulations so you know your baby is wearing a safe handmade product. I do take custom orders and I'd love to make one for your little one! I tried out one of her Hybrid Fitted Diapers which retail for $27.00-$28.00. Here is the one we tried. 100% cotton knit, a hidden layer of poly fleece, and an inner layer of soft, luxurious organic bamboo velour. Ok so when I saw the Christmas Grinch print i almost died. One of my all time favorite Christmas shows to watch and I was so excited to put this diaper on this babies bottom. It has a snap down rise and snaps across the waist with cross over snaps. 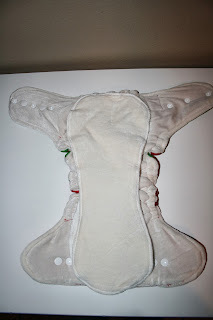 That is a must for us with a skinny baby especially getting a good fit with fitted diapers. This is out favorite style that I will choose. Now once you can get past the super cute print lets go look at the inside. I was a little nervous that the inside was white but so far so good. We usually try to stay away from white diaper just in case. The inside is so soft and it is made out of a 5 layer petal style soaker. 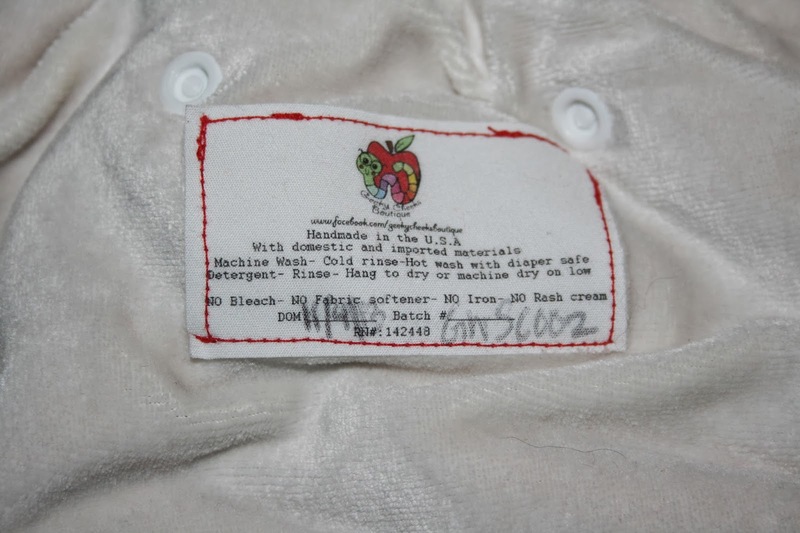 4 layers of super heavy organic bamboo fleece topped with the same velour used inside the shell of the diaper. 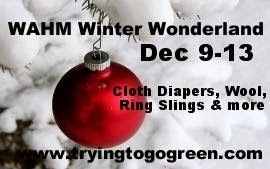 Making every part that touched your baby 100% organic. 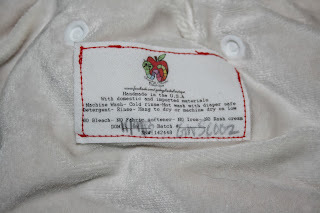 All of her diapers come with a label on the inside with washing and care directions as well as manufacture and batch date. Here is how the diaper looks on. He is 17 lbs and I can still cross it all the way over to make a nice tight fit. These diapers are not waterproof so you will need a cover. I like to use this diaper for nap time. If the front wasn't cute enough look at the backside. Now if that doesn't say have a merry Christmas I don't know what does. Make sure to check her out of facebook she is having a giveaway as soon as she hits 500 likes. Go over HERE and show her some love and win a super cute diaper.